I always felt like having a team of Rangers also have to turn around and bump heads with erstwhile allies in the military was always a natural story tell. We saw a lot it in RPM, but at some point you always feel like there should be more conflict. Think about the 1995 MMPR movie. While the Rangers are getting their new powers, there's no way you would't at least see some military units take on Hornitor and Scorpitron. Assuming Los Angeles as a stand-in for Angel Grove, there are significant military assets that would be responding within hours. The types of fights I had in mind were more along the lines of some of the climactic ones in Revenge of the Fallen or Dark of the Moon from the Transformers franchise. Last edited by Sevenlima; September 27th, 2018 at 01:53 PM. I wrote a Fushigi Yuugi fanfic where each chapter was named after an episode of PR. That's about all of my contributions to PR fandom tho. 5 (later 7) rangers who use the power of cards (ala Goseiger). However, unlike Goseiger they are not angels, in fact they don't know who or what they are, just that they have these cellphone/card readers and are tasked with saving the world. As time goes on, their pasts unravel, revealing that they are the "Children of Prophecy" a group who is destined to save the world. They later find out that they are all dead, having been resurrected by their mentor, an angel who's been tasked with watching over them, but won't tell them anything about how or when they will be able to go back to their lives. As the battles end, the rangers are supposed to cross over into the afterlife, but their two human friends (the 6th rangers) make a wish for them to be able to stay, and, since the prophecy has been fulfilled, the angel decides now is as good a chance as any to grant their wish. -The way the visor forms is the symbol in the display window on the outside of their cellphone changers is projected outwards, then it grows and flies back onto the helmet. The gag here is that it hurts. -One or more rangers losing their transformation card, could be possible running gag for comedic relief ranger. -6th rangers constantly being late to battles. The plan with them into do siblings like the Sutou's, but in this case with an age gap of about 5 years, so one is still in high school and the other is in college. Can't exactly just run out of class. -The "lost changer" gag is going be a regular for one of the females. Okay, I've just nabbed Maskman and removed the subs from GUIS to have the Stand Alone Bunny Hat Raws. What I am thinking about the suits is if they can be used in the "SPD Universe." These five pictured below are the "SPD MASKMEN." The "SPD MASKMEN" are a group of hunters who are the underdogs of the story. They aspire to become "S-Rank B-Squad" but they are just "B-Rank B-Squad." The colors and ranking are Red 1, Black 2, Blue 3, Yellow 4 and Pink 5. I will edit this post as I figure the world out more. So..this is kind of my first entry into RangerBoard, but I kind of came here to chat amongst fangs and share my ideas! The story starts in Brighton Heights, sister town to Stone Canyon. An alien touches down on Earth, revealed to be one of the ancient protomen, who has come seeking heroes for a desperate cause. Turns out that this alien is being hunted by a group of space pirates, who have come seeking the Earth's Crown Jewel. Our alien warrior is Don Garde, looking to recruit a group of teenagers with attitude. The Red Wolf Ranger, who controls the Red wolf novazord. He's a little nerdy, unlucky, and somewhat controlling. Dillon controls the Red Wolf Gauntlets. The Blue Whale Ranger, who controls the blue whale novazord. Misty's a little bit of a hot-head, who's determined to do right. Misty controls the Blue Whale hammer. The Yellow Falcon Ranger, who controls the yellow falcon novazord. He's a daredevil and adrenaline junky, who won't back down. Aside from being a little impulsive, Clark controls the Yellow Falcon bow. The Black Bear Ranger, who controls the black bear novazord. He's kind of a pun hurler, who avoids trouble. Howard wields the bear claw weapon. The Pink Shark Ranger, who controls the pink shark novazord. Rena is a little enigmatic, who happens to be the most cool-headed and mature of the group. Rena wields the Pink Shark Fins. Last edited by Manhunter; November 6th, 2018 at 01:55 PM. Edit your post and remove colours. Hard to read? I get what you mean. what i did is rewriting 3 seasons of mmpr into three different show in a style of arrow-verse, a three show that have concurrent narrative to each other. but i based it's narrative similarly to stranger things element as i made the first season set in 1990 not 93', because i like my story began at the earliest 90's timeline so i can make a jump if i wanted to continued the series into, idk, Eltarian Wars trilogy maybe. MMPR> Based on Original MMPR, a bit of boom studios characters sans drakon and 69', Zyuranger for the monsters approach, KOTOR type lore for their relationship with zordon, MCU movies tone and Buffy. MMTR> Based on Stone Canyons (Rocky, Adam, Aisha), Kat, Richard, David, Dairanger for weapons and villains and zedd as the big bad, Avatar to deal with powers and philosophy, Defenders for aesthetic, Riverdale as the ongoing mystery element. MMAR> Complete revamp on aquitars as i make them into different races of alien that inhabit Aquitar, similar to Elder Scroll's Tamriel, but they have a very diverse tech, from beyond the badlands level, to Firefly level tech, i think i also adding Kakuranger for their mech system but also adding Sonny Chiba's Shogun for further references, add jetman for the sixth ranger i think. This.....intrigues me very much. Just please remind me who Richard and David are, I really don't quite remember them. Would love to read how you intertwine all of this, especially about a team that presumably has Adam, Rocky, and Aisha being able to really define themselves from the get go as Rangers in their own right instead of being saddled with replacement stigma. David is based on David Truehart. He will be the White ranger, however i also wanted to make an chapter for Tommy as a white ranger for MMPR movie adaptation that set between The final battle on Angel Grove (Tentatively "Battle of Angel Grove") that serve as crossover season finale for 3 shows and Zeo, that i plot as the first show to open the Eltarian Wars saga. So here's the thing, i plot MMPR in Angel Grove, and MMTR on Stone Canyon, so it's already make a first difference as they were protector of own city though MMPR came first in 1990 then MMTR gain their power in late 1991/early 1992.
secondly, I made those three teams had a different dynamic, MMPR Team is basically a Teamwork of a group with a leader that needs capability to understand what his team needs to gel them, MMTR team is a team that already had a basics to fight the bad guys they have to fight prior their power were given, but they don't need a singular leader because they already have an understanding that all they have a job that needs to be done by working together as equal, so they can be lead by any members concurrently by democratic way or maybe on the go, now MMAR, they are band of Rebels that wanted to ousted evil invader by any means necessary, but they need a leader to remind them how to do it right without costing any innocent, now gradually they'll learn to wield their powers by understanding the true purpose of a freedom. Last edited by Utomowatch; December 6th, 2018 at 08:36 AM. The Prism Rangers were the original Pilots of the Super-Zeo Zords and thus by extension protectors of the Zeo-Crystal. Though they failed to prevent the conquest of the M51-Galaxy by the forces of evil, they bought it’s citizens enough time to flee and hide the Zeo-Crystal. They too survived this struggle, but had lost their powers and, not knowing where to they hat fled, were unable to reconnect with their fellow people. So they made it their task to guard the Super-Zeo Zords. To do so they sealed the machines into the Super-Zeo-Gems and saw to their disappearance by exiling themselves to the Planet Triforia. The existence of the Prism Rangers was first alluded to in the Power Rangers Dino Thunder episode “Bully for Ethan” and later confirmed in Power Rangers Super Megaforce. The fact that the Super-Zeo-Zords existed well before the beginning of the first season and where though to be lost were both established in the Power Rangers Zeo episode “A Golden Homecoming”. 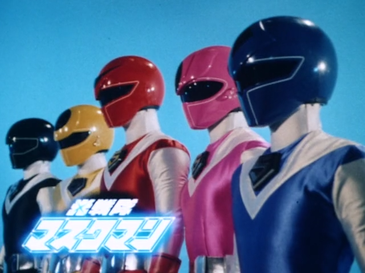 The Starforce Rangers were chosen by Zordon as protectors of their home world Tarmac 3 during the first war with Rita. They were supposed to wield the Thunder Zords, but due to wartime supply shortages only the Shuttle Zord Tor could be constructed. They were tasked with the destruction of the Sword of Darkness, but it was stolen by Knasty Knight before they cloud finish their work. Though they couldn’t prevent Knasty Knights escape with his prize they managed to remove the swords protection from destruction. This however came at the cost of their powers. The existence of the Starforce Squadron Rangers was first alluded to in the Power Rangers Dino Thunder episode “Bully for Ethan” and later confirmed in Power Rangers Super Megaforce. The Legend Knights were chosen by Zordon as protectors of their home-world Sorcery 7 during the first war against Rita. Due to wartime supply shortages the Rangers were fielded without Zords of their own. Fearing Sorcery 7 inhabitants for their vast knowledge of the magic arts Rita sent Terror Toad to destroy them. With most of the planets inhabitants captured, the Legend Knights saw their only chance of stopping the monster to force feed all of their powers into it. This sacrifice made Toad explode from the overload but safely restored its victims. The existence of the Legend Knight Rangers was first alluded to in the Power Rangers Dino Thunder episode “Bully for Ethan” and later confirmed in Power Rangers Super Megaforce. The people of Redna 2 gladly joined Zordon’s efforts in the first war against Rita. They offered their vast scientific resources to help the wizard in the development and construction of Zords for his various Power Ranger teams. In return Zordon helped the people of Redna 2 to create the Supersonic Rangers as their very own protectors. To counter this Rita sent Eye Guy to capture Redna 2 incredibly bright children, hoping to use their intelligence for evil. Though this didn’t work out it gave her a leverage to demand all the data regarding Zord development. The Supersonic Rangers managed to free the children, but unable to find a weak-spot they could only prevent Eye Guy’s escape with the data by blasting him with and thereby sacrificing their entire powers and losing the data. The existence of the Supersonic Rangers was first alluded to in the Power Rangers Dino Thunder episode “Bully for Ethan” and later confirmed in Power Rangers Super Megaforce. The Spyglass Squadron was a team of Rangers fielded by Zordon during the first war against Rita. Due to wartime supply shortages they lacked Zords but wield highly advanced sensory equipment and acted as Zordon's reconnaissance. Using a fragment of the Babelstone, a rare mineral that blocks all sensors and communication, Rita prepared a trap for Zordon’s Forces. Since the Rangers couldn't warn him they sacrificed their power in an attempt to destroy the fragment. With communication restored, Zordon and his allies managed to turn the tables on Rita. The fragment meanwhile hadn't been destroyed. Instead its properties had gotten reversed. This allowed Zordon to create a universal sensor he dubbed the Viewing Globe. The existence of the Spyglass Squadron was first alluded to in the Power Rangers Dino Thunder episode “Bully for Ethan”. The Babelstone was first introduced in the second annual issue of the Boom-Studio Power Rangers Comics. The Beast Warriors were a team active during the first war against Rita. Due to wartime supply shortages they didn’t have Zords. They were members of Earth’s first high culture of Animaria. They had learned to channel and unleash their animal spirit in ways that allowed them to be used offensively, including cladding oneself inside its protecting energies thus morphing themselves into Power Rangers. They lead their homelands resistance against Rita and often clashed with collaborators like the Beast Warrior Scorpina. In the end, they were the ones responsible for forcing her into hibernation. The existence of the Beast Warrior Rangers was first alluded to in the Power Rangers Dino Thunder episode “Bully for Eathan”. The Lightning Blitz Rangers were a team that was active during first war against Rita and had to be fielded without Zords, due to wartime supply shortage. They mainly performed hit and fade attacks far behind enemy lines, and thus were some of Rita’s most despised enemies. Shortly before the end of the war she managed to corrupt them through poisoning them with Baboos Punk Potion. They wrecked incredible havoc in Zordon’s camp, but could be cured by using the sap of a singing squash found on Dramak V. Zordon however kept this a secret and pretended to having be caught by the apparently still rough Rangers. They pretended to offer him to Riat in a bid to join her, thus enabling to infiltrate Earth. This ploy allowed them to defeat the War-Zord Cyclopsis and enabled Zordon’s Forces to take earth, with Rita having to retreat to its moon; this however cost them their powers. The existence of the Lightning Blitz Rangers was first alluded to in the Power Rangers Dino Thunder episode “Bully for Ethan” and later confirmed in Power Rangers Super Megaforce. Last edited by BlazingRedRanger; Yesterday at 08:18 AM. a evil magical board game about an mystical land called Qania , full all of the creatures you see in a fantasy setting. the whole land is ruled by the awe-inspiring magus Mircas (evil wizard lady). the team finds the game and plays it now its up to them to end the game get rid of mircas (think of jumanji but with and rpg tone). the awe-inspiring magus Mircas- the villainous mircas wonders if there's more to life just victor (pink mage ) since she find out hat her whole world isn't even real . I think Fiveman PR version should be called earth force. KouseiRed to the rescue ! Hey guys remember my own made Super Sentai ? Welp I've update it. My Super Sentai is named Kessho Sentai Kouseiger genre Military Super Sentai with animals crystal gimmick and cards for the henshin process. Crystal Beast) those are animals who are composed of living crystal from the Andromeda Galaxy they are like silicate based living being. during the time where earth was only made of one continantal block called Pannotia (650–500 Ma). Burried deep into the ground tired their bodies decayed but for millions of years they fought bravely to stay alive... Until a scientist and geologist named Uma Shinzen discovered their existence. To late for restore their former body the scientist proposed to the livings crystal being to transform them into powerful vehicle ? The Koukanjuu kesshou agreed. 10 Years later a threat is comming to earth with 4 Space monsters armies who seems fighting among themself have decided to establish their final war on earth, without caring about it's inhabitant. Under the supervision of a Japan Military Branch called NUMSaFo (National Unit Militia Saving Force) the Koukanjuu kesshou are being transformed into powerful Vehicle called Kousei-Machine. My Super Sentai is composed of 12 Warrior. Some of them are Zyuman others are humans and others again are from somewhere else. The main Sentai corps use Crystal Card who are being inserted in a Crystal Brace Morpher and have the shape of the head of their respective Koukanjuu kesshou and colors. They all have two supportive other weapon such as one dagger and a gun. In addition we have also for complete the main team two Supportive Kouseiger Warriors who use Crystal Card and a Crystal Gun Changer. For information they are kinda Androids being. The whole teams is under command of one leadership who can help the team when needed he use Crystal Card and Cristal Stripe Side Shifter. He possessed two supportive weapon which are comprise of two Crystal Revolver and one Crystal Katana. At one point the team will have an evil duo turned good guys/humans monsters with their Mecha, their henshin device is Crystal Card and Phone Changer. Anko as KouseiNavy a man former cybernoid Hellhound monster with the attribute of Shadow and Smoke using a Crystal Scythe. Hikari as KouseiCrimson a woman former Cockatrix monster with the attribute of Light and Vapor using a Crystal Gauntlet. The team finally will have a part time support member whish is the scientist who discover the SeijuKesshou she use Crystal Card and a GripCard Transformer. She had just one supportive weapon wish is simply a Crystal Pistoldagger (a transformative weapon who can switch into two mode). To form The DaiKouSei ! To form The GingaSei-Oh ! To form The ChouSeidan ! To form The RenseiRobot ! My Super Sentai fight against four armies and one puppet master who seek only carnage through fight also maybe this puppet master is connected to the Koukanjuu kesshou ? A Space Demonic Army of fierce warrior based on Rock + Minotaros + Gladiator kinda ressembling Space Golemish monsters. A Space Evil Pirate Organisation based on the monster Hydra and the element of water as well as other inspiration from reptilian mythological monsters but with a space twist on their look. And finaly one puppet master who are also a Bounty Hunter/Planet Eater and based on Shadow and Death itself. What are your thought about this updated version ? Star dragon task force dragonman.